Our DIY kits can offer considerable savings against ready-made systems for those that don’t mind putting a little extra time and effort in to get up and running with their system. We have now helped literally hundreds of people set up their own system with our kits which arrive to you 90% pre-assembled so that all you have to do is mount the sub-assembled units, connect them together and add water! All required equipment is included. Earn up to 646 Points. From our starting price simply add the size of tank you require; select the size of Reverse Osmosis or DI only, size of pole and brush required and select any of the other options listed below to build up a price and equipment list to suit your needs. We can supply all the necessary equipment including all sizes of tanks, reverse osmosis/deionisation units, hoses, reels, poles and brushes. As always quality is at the forefront of our minds as reputable suppliers and engineers; make no mistake that the equipment we sell with these kits is just as robust and efficient as the equipment on the most expensive fully fitted systems on the market, and furthermore, cleaning performance is just as good! We can provide range of equipment to suit all needs. If you require any equipment that you do not see listed here or anywhere on our website please do not hesitate to make contact. Also if the list of DIY equipment contains components you do not require again please make contact with a list of equipment you do require and a bespoke quotation will be prepared for you. 1 x 5/6 stage compact Reverse Osmosis system complete with 3 stage pre-filtration and 10 inch membranes. 1 x Deionisation Filter complete with top grade Tulsion brand Deionisation Resin. 1 x Digital Hand Held TDS Meter (more accurate than most inline ones). 1 x 100psi Shurflo Pump with Strainer and Fittings for 1/2″ Hose. 1 x Flowmaster Electronic Pump Controller – Please add your choice as you cannot have a system without one- see available options below. Both the Shurflo pump and Flowmaster are pre-mounted on a compact panel and pre-wired together ready to connect to your battery. – All you have to do is mount the panel! 1 x Outside Port Panel with Connector – This will allow you to work from the system with the vehicle fully closed and locked! 1 x Pure Freedom Professional Metal Hose Reel With Two Year Warranty. 1 x 100 metre roll of 8mm ‘Microbore’ Professional Hose. 1 x 17FT XTEL professional glass fibre water fed pole with braided hose. 1 x Vikan Oblong Brush. 1 x Adjustable Brush Angle Adaptor. Pole, brush and angle adaptor all come assembled and ready to work with all required fittings. 1 x 5m roll of 1/2″ hose to connect the parts of your system together. 1 x Comprehensive installation and operation guide with diagrams. Tank Size: We offer a range of heavy duty baffled plastic water tanks from 125 to 650 litres in upright and flat orientations complete with tank outlet valve fittings kit to join to 1/2″ hose. For more information on our tanks see our tank section. Pole Valve: Our pole flow control valve is fitted to your water fed pole to give the user finger tip control of water flow at the brush. Benefits include – increased efficiency by being able to stop the water flow between windows, no need to keep a constant grip as with triggers, falls naturally to hand making it effortless to use. Booster Pump: To increase the pure water production rate from your reverse osmosis unit you can add a mains powered booster pump. This will typically double the rate at which you produce pure water. Transfer Pump Kit: The transfer pump kit is normally used in situations where the pure water is produced and stored into a storage tank at base before being transferred to the tank in the vehicle. This transfer pump kit comes with a mains powered 100 litre per minute pump, 5 metres of large bore transfer hose and a ‘petrol pump’ type trigger nozzle. RO System: The Reverse Osmosis system is the most efficient way to produce pure water in areas with all but the softest water. 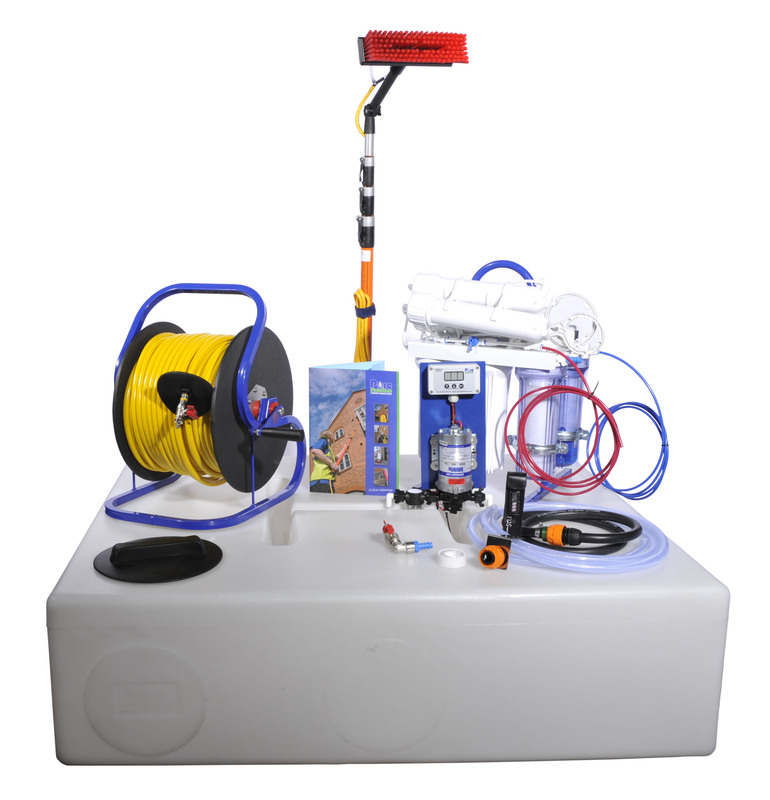 There are three sizes of RO system available with the kit – 200, 300 and 450 GPD. The only difference between them is the rate at which they will produce pure water. Typically without a booster pump fitted the 200 GPD unit will produce 150 to 250 litres per day, the 300 GPD unit will produce 250 to 350 litres per day, the 450 GPD unit will produce 400 to 500 litres per day (based on 50psi mains water pressure – this is only a guide and could vary considerably). Pole Type: A range of pole sizes and types are available to reach from 1 to 7 storeys with the smaller poles starting off in glass fibre up through the hybrid range (a mixture of glass and carbon fibre) and finally on to full carbon fibre poles for the higher reach. The Standard version of our digital Flowmaster pump controller simply allows the user to accurately control the speed of the water pump and therefore the flow rate out of the brush head, as well as detecting when flow has been stopped and offering a battery voltage display. The Charging Flowmaster, in additon to the features of the standard version, offers the option to charge the system battery from the vehicle battery without the risk of discharging the vehicle battery. The Flowmaster radio remote advanced option will allow you to switch the pump on and off remotely without having to return to the van each time to switch off the pump. It has all the regular flow control features of other Flowmasters in the range. 11″ Oval monfilament brush complete with twin brass pencil jets. 12″ Rectangle monfilament brush complete with twin brass pencil jets. 12″ ‘HiLo’ monfilament sill brush complete with twin brass pencil jets. 12″ Stiff bristled ‘HiLo’ monfilament sill brush complete with twin brass pencil jets. Battery: We can supply a powerful 85Ah 12v deep cycle battery to power your system – this must be charged after every use and comes with a 3 month warranty period. Charger: We can supply a professional connect and forget charger for the above mentioned battery to keep it in the best condition. Protecta-Kote Kit: The ready-to-use Protecta-Kote kit contains all the accessories needed (masking tape may be required) to have a tough anti-slip, water proof coating in your pick-up truck, van or 4×4 in only a few hours. Our brand new and updated DIY kit guide includes all the necessary information you need to be up and running with your kit as fast as possible and with the least stress! When installing and setting up these systems the assistance of someone with at least a basic knowledge of water fed pole systems is recommended, but as always our technicians will be happy to assist with assembly and fitting via telephone and e-mail during normal office hours. Please note: For safety reasons all tanks and equipment should be securely fastened in the vehicle, preferably with a purpose built cage to surround the tank. Please call us on 0333 1234 365 if you would like us to quote you for metal work fabrication. *includes 3 sets of pre-filters based on the recommendation that they are to be changed at least every 4 months, Resin refills based on 700ml (10″) Vessel. All Equipment in stock ready for immediate assembly and dispatch !